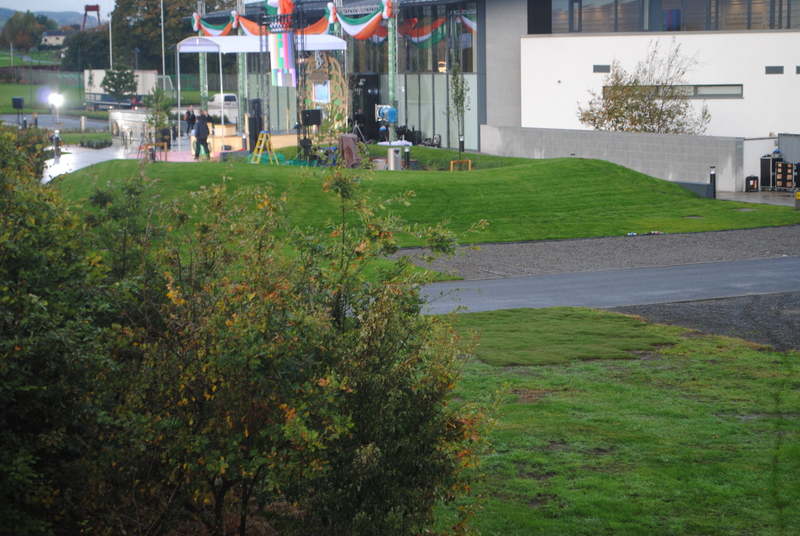 This was the public’s view of Scientology’s new facility (in the Republic of Ireland at Firhouse, which is just outside Dublin). The picture to the left was taken on the day of its opening – the 15th of October 2017. The white area all around the perimeter isn’t a wall. It is exterior quality board, painted white and firmly fastened onto the outside of railings. 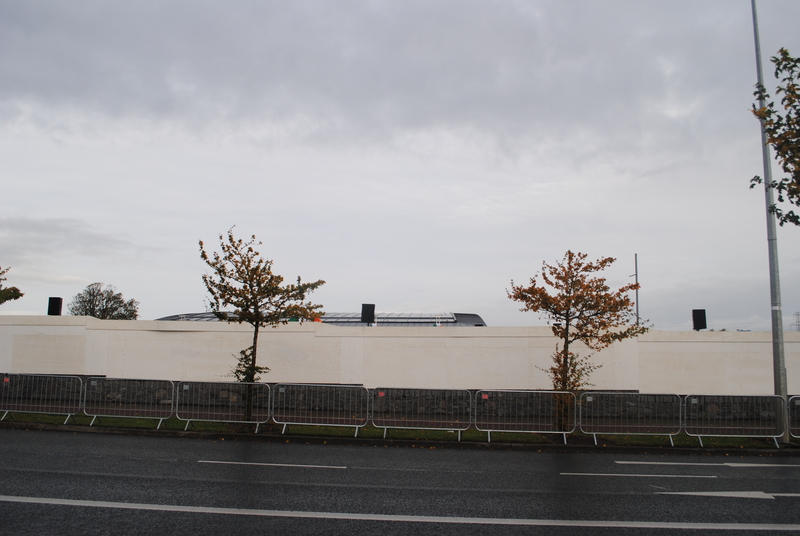 It’s only purpose is to stop local people seeing what is going on inside and must have cost a few thousand Euro in materials alone. Just in case someone might have brought a stepladder and looked over the wall, the pavement and cycle track that run around the building were surrounded by crowd-control barriers (incidentally closing the bus stop, too). Private security guards, retained by the Church of Scientology excluded local people from the area for the entire day – but admitted Scientologists. The council may have given permission for the closure because they were told it was necessary for building works. They may not have authorised this if they has known that the real purpose was to stop outsiders looking over the wall and seeing the leader of Scientology, David Miscavige, performing the opening ceremony. Approximately 14 private security guards were retained. Most gathered at the main gate (at the opposite end to the guard in this picture) . 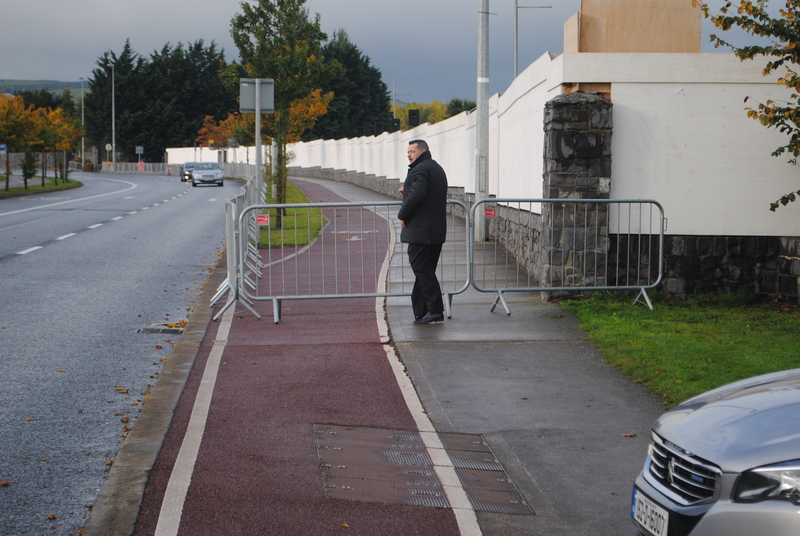 However one man always ‘patrolled’ the fenced-off area, admitting Scientologists to the pavement and trying to turn away locals, forcing them to cross a fast road instead of using a public path. This high-handed attitude has provoked a strong response from the people and the press of Ireland. Read on for an eye-witness account, with pictures and video. According to the 2016 ROI Census, there are 87 Scientologists in the country. This figure which includes Independent Scientologists and minor children, so there are probably fewer active members. 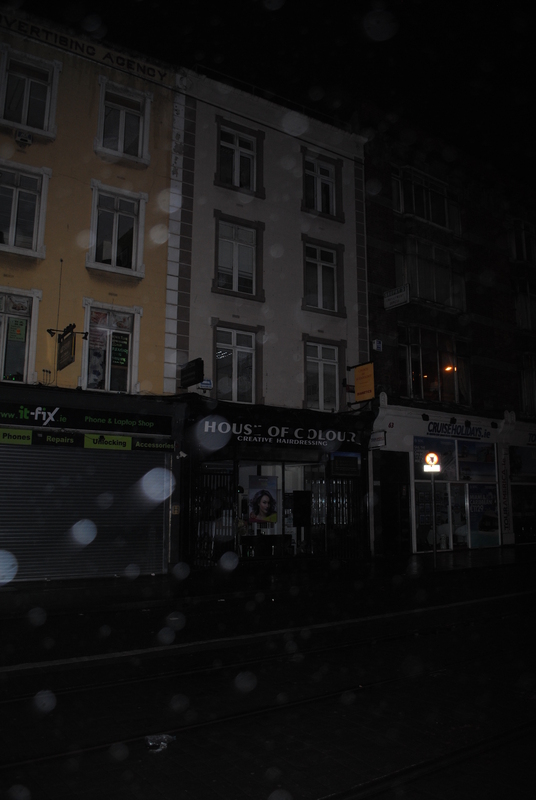 They have operated out of a upstairs office in the centre of Dublin above a Hairdresser’s shop for years. Now that their new facility is open, you would think that they would close this one. They may not. The founder, L Ron Hubbard made it a ‘high crime’ to close a facility, once opened, and it is better placed for foot traffic. (Edit 16th October 2018: I’m reliably assured the place has been abandoned, despite policy). The pictures below were taken on the same day as the grand opening. It’s a modest place, but appropriate to their small numbers. It looks like this at 06:00, when it’s raining. Their extensive new buildings and grounds were acquired from a failed mega-church and converted in record time. They include a 1,200 seat conference facility. It all cost the Church of Scientology an estimated six million Euro just to buy, and more to customise. The architects who designed the original buildings (when it was named “The Victory Centre”) were very proud of their work, and it is a remarkable building, money no object. Here’s what it looked like on Google Maps before Scientology bought it. 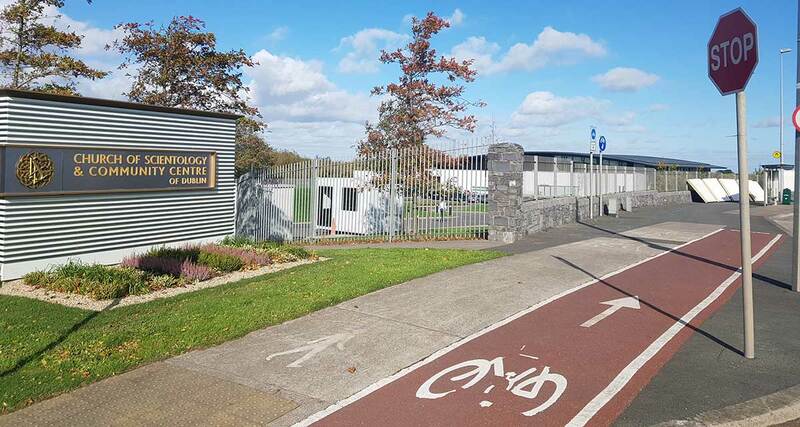 Please note the fence, the public footpath and the cycle track. There’s also a bus stop, just out of shot. 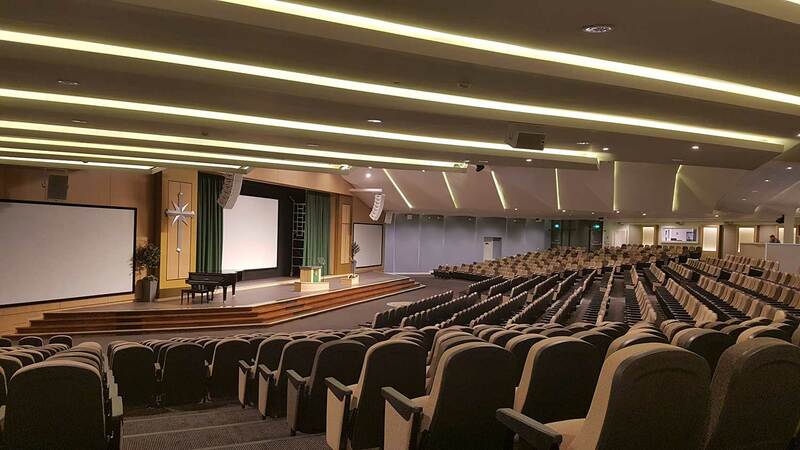 Spending a fortune buying and customising a building like this for only 87 local Scientologists is something the media reports (see bottom of this page) have acerbically commented upon. Why did they do it? Does The Church of Scientology Have a Hidden Agenda? Two things should be noted. Firstly, the present UK Headquarters of Scientology is in East Grinstead, just outside London. Saint Hill Manor was bought by L Ron Hubbard and he ‘developed’ many of Scientology’s ‘advanced’ teachings there. It’s the nearest thing they have to a shrine. It will always be an important site for them. 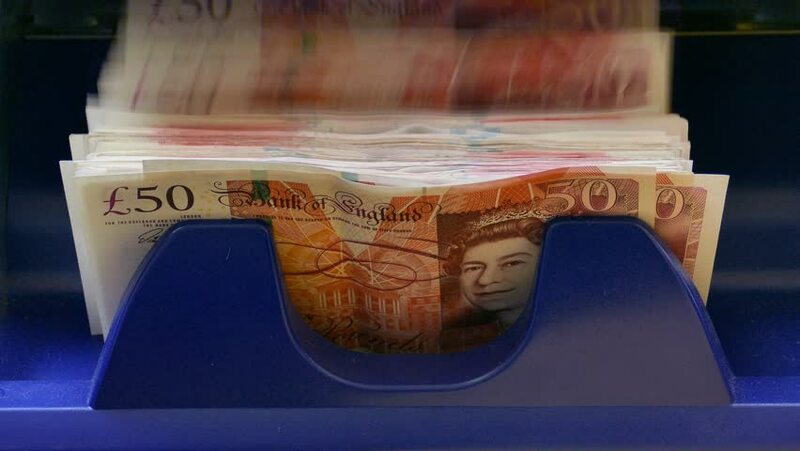 However, now that the UK is leaving the European Union, Saint Hill will likely find it more difficult to move money through the EU. 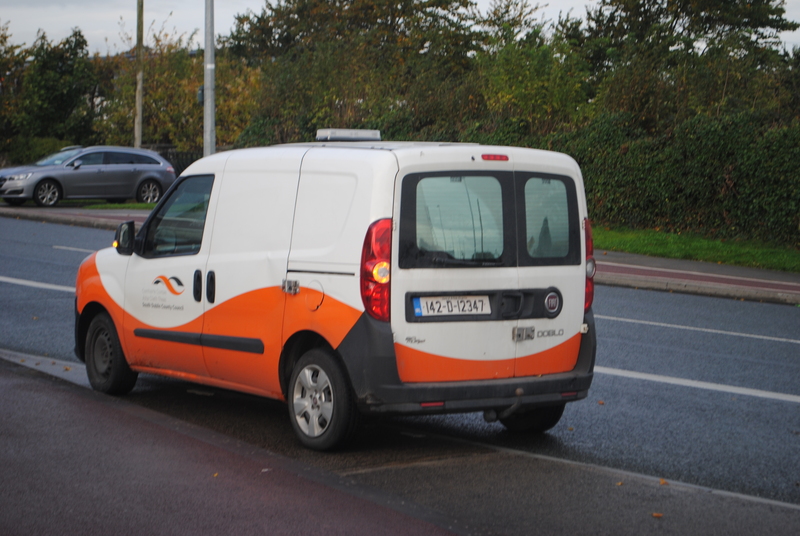 In the Republic of Ireland, English is spoken extensively, and you can pass over the border with an approved photo ID – a UK driving licence will do. This gives you a base from which to deal with EU countries, close enough that the strings can still be pulled from Saint Hill. Secondly, Scientology benefits from a tax evasion scheme that involves the commonwealth country of Australia. Close ties between Australia and the UK have enabled them to register their entire UK operation in Oz. What’s more, they did so in the State of South Australia, where they are recognised as a tax-exempt religion. Consequently, they don’t pay any UK tax. If the UK tax authorities were to clamp down on this deal, Scientology would need a new tax haven, and Ireland is very corporation-friendly. Even if that were not to happen, it’s likely easier to move money back to the US from all over Europe if you have a nearby, European base where English is spoken. Since the organisation is very inflexible, they won’t move. Firhouse will pretend to be Independent, but the strings may well be pulled from England. 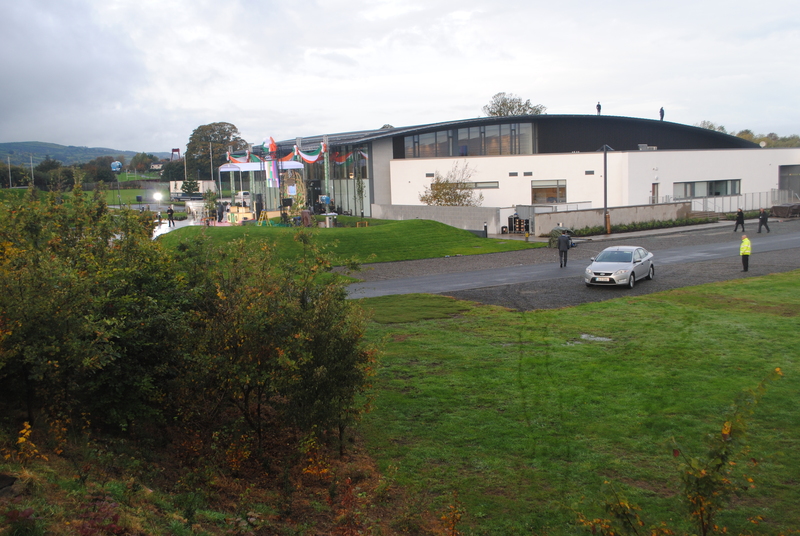 Buying and renovating the building at Firhouse alone has put an enormous amount of money into the Irish economy. That may be how they are planning to appeal to politicians. 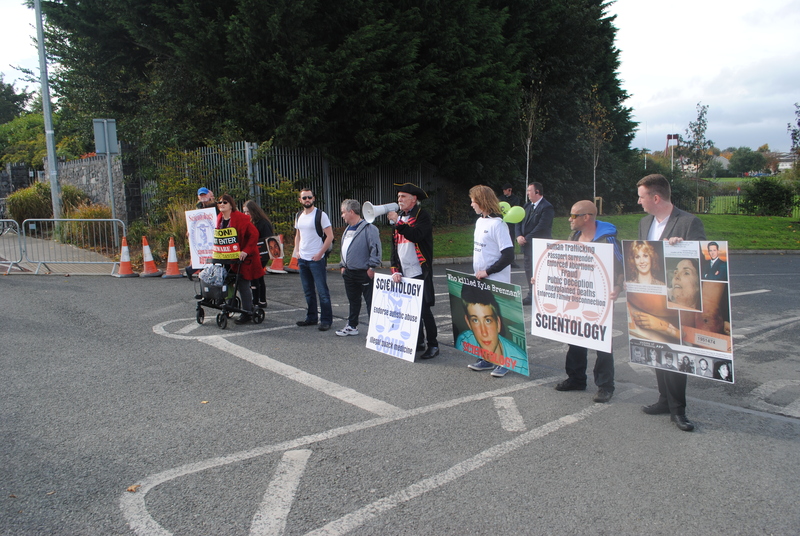 Political lobbying by Scientology has already been going on in Ireland for a year. A year ago, the Church of Scientology opened a “National Affairs Office” (a political lobbying centre) at a prestigious address in Merrion Square, North Dublin. It cost them two million Euro to buy. The Irish Times characterised it as part of “[…] a spy network setting honey traps”. Whatever Scientology is up to in Ireland, it is not suddenly spending a good 10 Million Euro on it’s 87 Irish members because it loves them. They likely have a political agenda here. At about 07:00 I arrived in Firhouse. There was nobody there, and the crowd-control barriers which would appear later had not yet been put up. 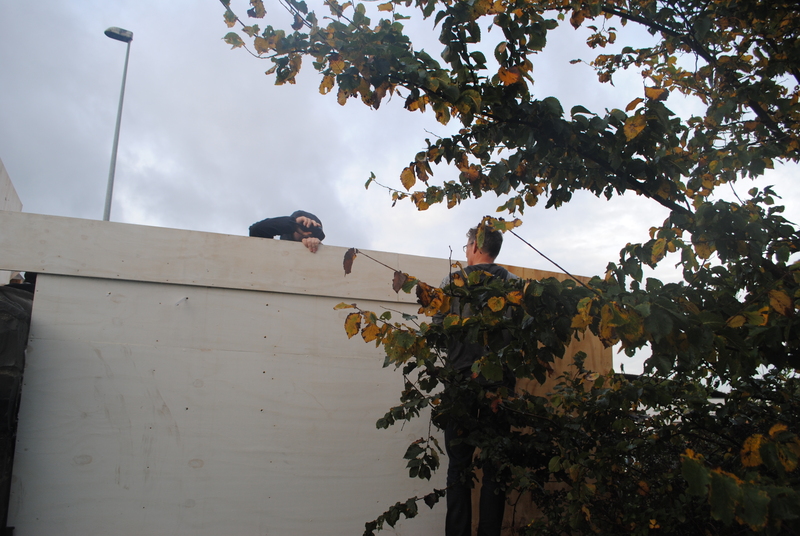 I was standing on the end wall, struggling with brambles and trying to get pictures over the top of Scientology’s improvised barrier. 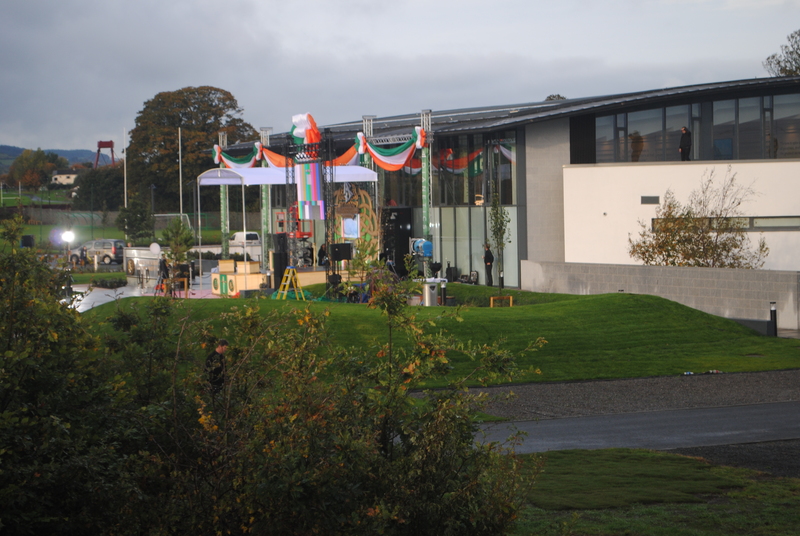 I was joined by a photographer from an Irish newspaper and together we both managed to get still pictures of the preparations. Some of mine aren’t framed very well because I was just holding the camera way above my head and guessing where is was pointed, but here’s a selection. Click on any image, and a larger version will appear in a new tab, which you can zoom in on. 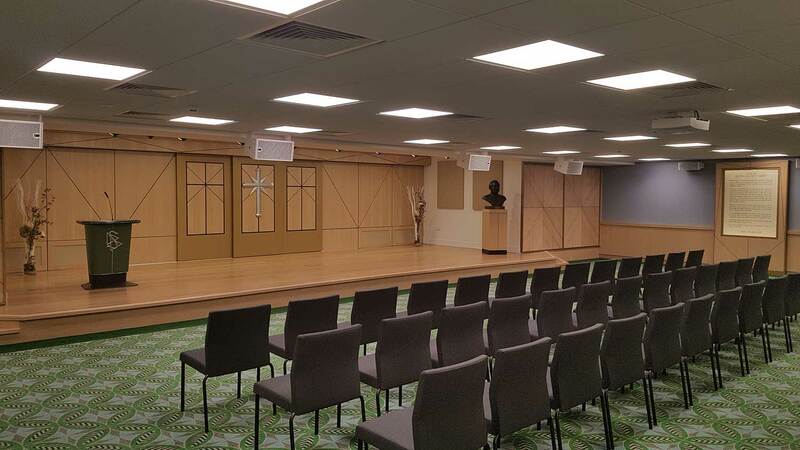 In the image above, you can see the Rosette and ribbon that it is used by David Miscavige to formally open these new facilities. Exactly the same ceremony takes place wherever in the world he is. He is filmed pulling on a rope that seems to release the ribbon. When the ribbon falls, everyone applauds wildly. In actual fact, insiders have stated that the rope is a dummy. The people who rigged the ribbon release it when they see their leader tug the rope. Later, local people gathered on the other side of the road told me that they objected to the use of Irish colours and interpreted the rosette (which was the only part they could see over the wall) as some kind of Celtic Cross. Scientology has no cultural sensitivity at all. While the photographer was working we were treated to an unwitting comedy act, courtesy of the Sea Org. I’d taken my pictures, so I got out of the way, and watched the friendly press photographer taking his. At this point, a man standing on a stepladder popped up from the other side and pointed a compact camera at him. Taking video of people is standard operating procedure for Scientology, and is supposed to intimidate their ‘enemies’. This behaviour will surface again later. However, the photographer was unimpressed. .
Then things got surreal. Occasionally declaring, “you have to leave now” the man on the inside started extending the height of the barrier with an electric screwdriver and plywood in order to block the view. When the photographer was finished, and had climbed down, a security guard turned up. This newcomer announced that the wall was private property, and stood in front of it, looking stern. We didn’t get a chance to go back, because that area was manned from then on, and crowd control barriers started to go up. After the barriers went up three or four security guards continuously manned the area – two at the end to admit Scientologists and exclude the public and at least one more to ‘patrol’ in case anyone hopped over. An early morning cyclist, a jogger and an assertive lady with a shopping bag on wheels went through anyway, looking angry and incredulous. Did Scientology Take Control of Public Land Legitimately? 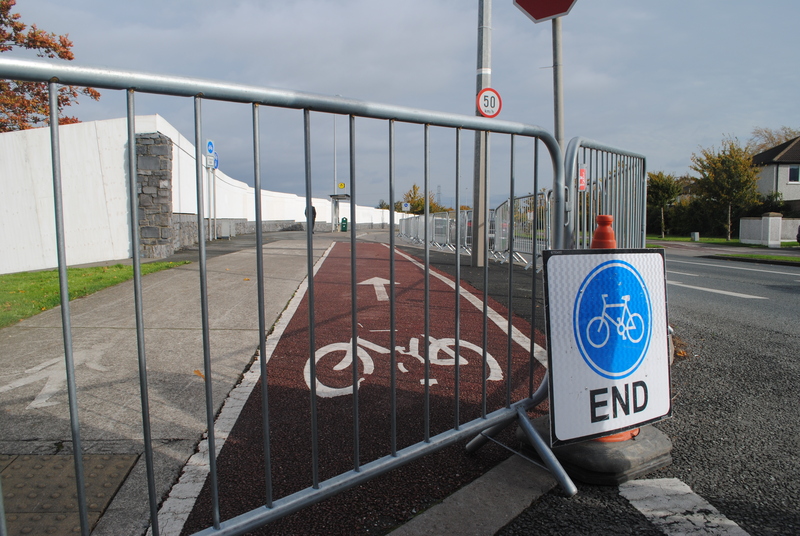 The bus stop and the cycle lane were blocked off by these barriers, and unofficial signs declaring them to be closed were put up. The closure of the pavement, cycle land and bus stop was later the subject of complaints from local people who called the bus service and the local Council. While I was there, someone rang the bus company. They spoke to officials who told them that they had no idea that the stop had been closed. Two days later, an online correspondent confirmed that the bus company had not been informed. They put up a temporary stop in a timely manner, and must have asked some pointed questions of the Church of Scientology. Also, council representatives turned up in a van (parked illegally 🙂 made some long ‘phone calls, then went away. 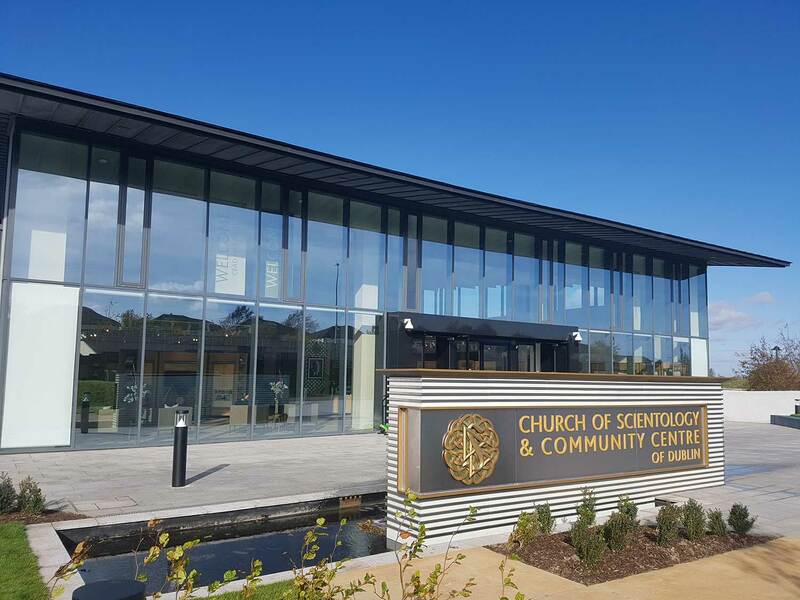 It emerged that the Council had given permission to close the area for “works” – but only when the head security guard was pressed to produce a document mapping the area that Scientology had temporarily closed. He refused to let me photograph it. 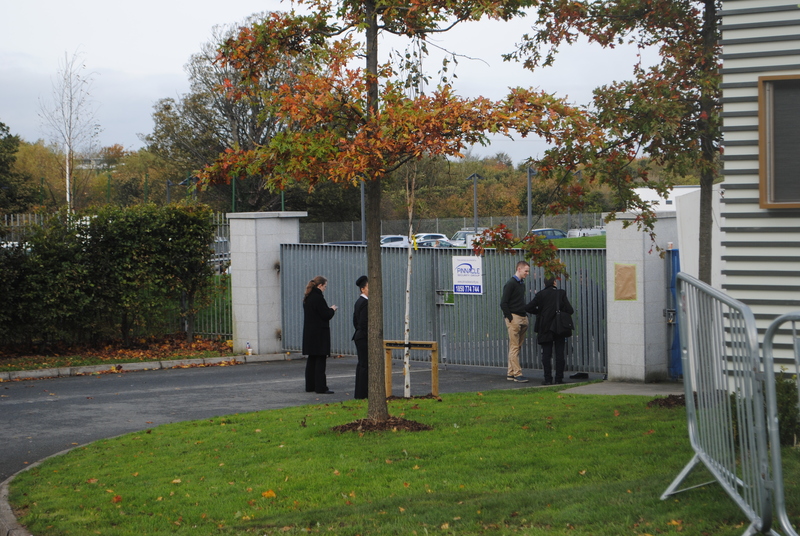 Scientologists, walking from a car park down the road, were admitted to the footpath by the guards. The barrier at the end was pulled aside for them after they showed their invitations. The permission to close the area was given for “Works”. In Council jargon, this means building work – like digging a hole in the road because unfettered access might affect public safety. There was no such work in that area, and visiting Scientologists were admitted to it. It’s possible that this document was obtained under false pretences. We don’t know because the ‘security’ people would not tell anyone the grounds for closure. I suspect that there will be some backlash from the both the Council too, now that Scientology has managed to get what it wanted, and Miscavige is gone, never to be seen again. There was no crowd as yet – where were the sound coming from? Why should Scientology take such extreme measures to hide what they were doing, then broadcast audio of the proceedings? 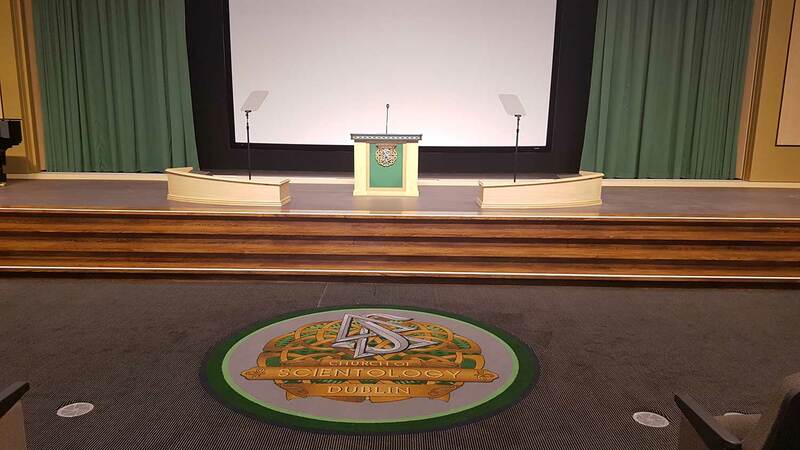 The speakers were directly opposite the rosette and ribbons which David Miscavige would pull down in the opening ceremony. I think it’s possible that the speakers were used to mask the sound of the ceremony this by playing recordings of crowd noises at a higher volume while it took place. 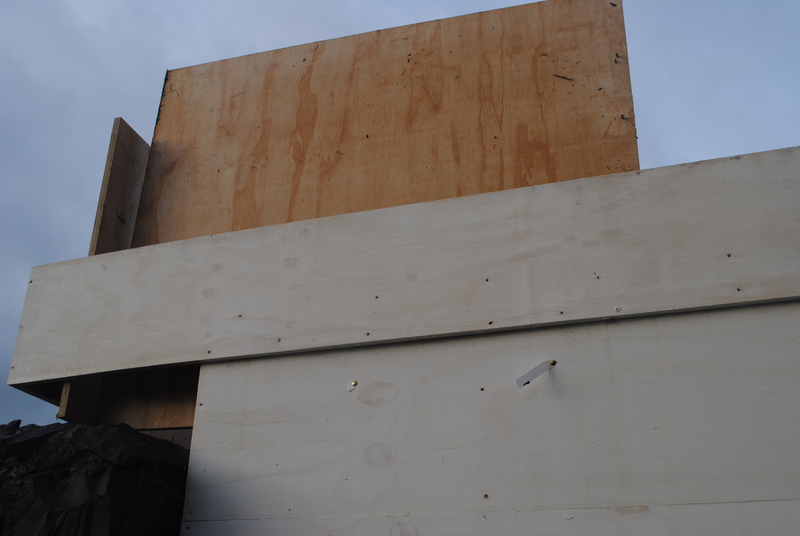 The boards were a deliberate physical and visual barrier. The speakers were an audio barrier, to stop outsiders (i.e. the people who live nearby) hearing David Miscavige’s Speech from the other side of the road. The outward-facing speakers came down shortly after the ribbon did. 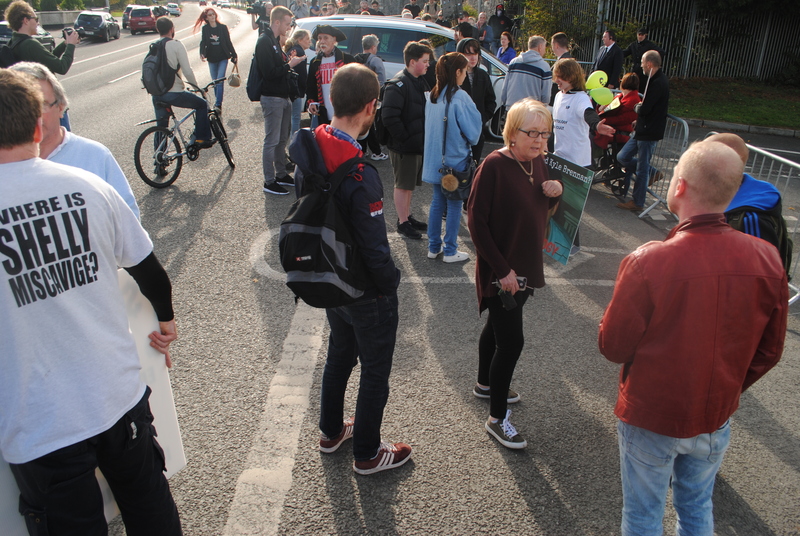 Protesters now started to make their presence felt at the main gate, and local people watched from across the road or joined in. Some held the banners brought by organised protesters, others had brought their own – for example this chap who had made use of a tree branch in his creation. As the number of protesters built up (locals who had turned up spontaneously soon outnumbered the organised protest) buses started to arrive packed with Scientologists. These had apparently loaded up elsewhere, and parked outside the entrance, so that Scientologists who attended could be quickly moved past the protest in large, controlled, groups rather than trickling in. Again, there was a little Scientology comedy involving a security guard with a stop-go sign, who stepped out into the road and blocked the traffic while the buses unloaded. After a while, a police car with two officers turned up to insist that the buses parked on their land, out of the road. 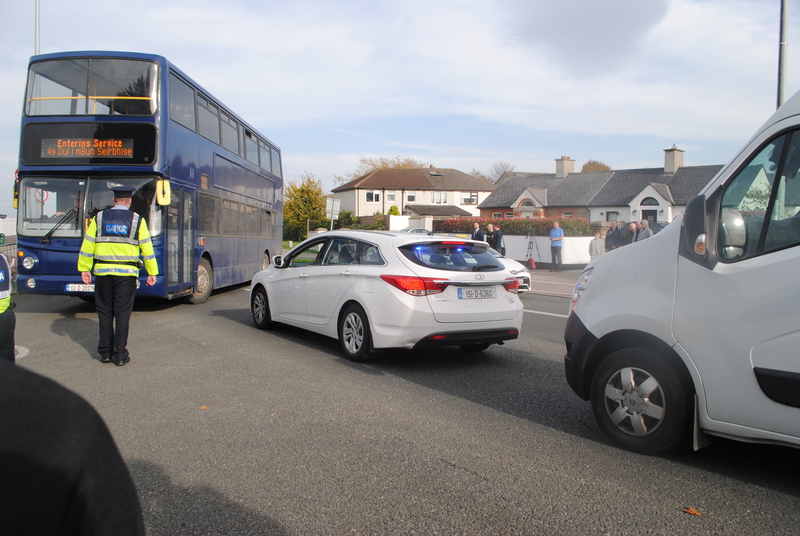 This blocked the entrance to cars, while the buses emptied, but allowed traffic to flow freely. 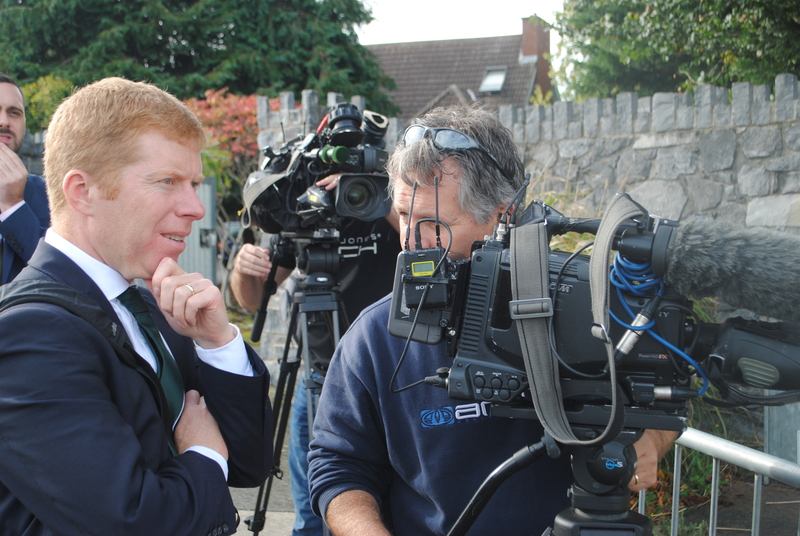 While this was going on, the press started to turn up in force – from both national and local TV, radio and newspapers. 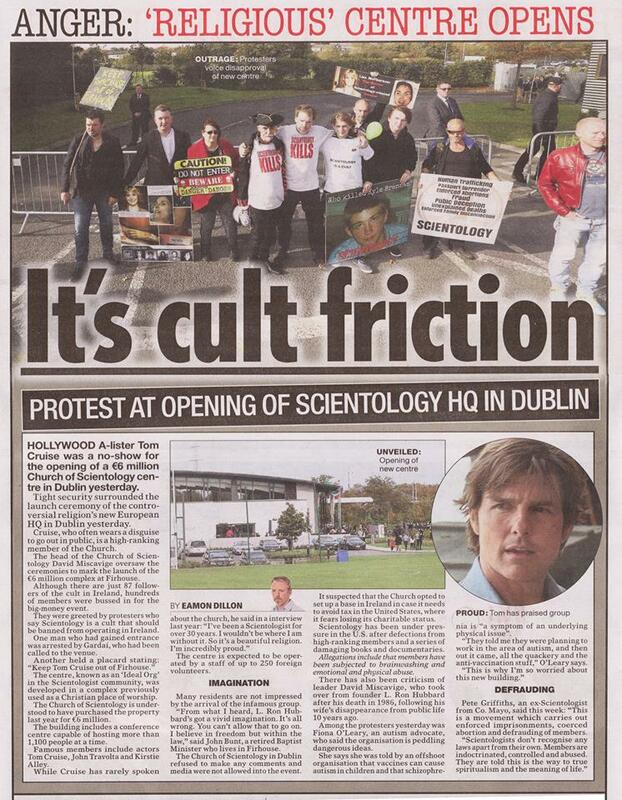 They interviewed Irish ex-Scientologists among the protesters, and tried hard to get a statement from Scientology. The only person they could talk to about this was the supervisor of the security force who was completely unresponsive. A reporter from the national Radio Station “News Talk” even tried to strike up a conversation with the Scientologists tricking out, but they all completely ignored them. This was Ireland. It’s easy to strike up a conversation (in fact, it’s hard not to :-). I spent more time talking to people who saw my camera, assumed I was with the press, and thought I might know what was going on, than I did taking pictures. People there are friendly and relaxed. Ignoring them, in the way that Scientologists faced with ‘entheta’ do, is rude anywhere – in Ireland it is perceived as exceptionally arrogant and creepy, too. Irish people outside had been more forthcoming. The crowd grows as it is joined by local people. The guards respond by putting additional barriers across the entrance. All of the Scientologists now seem to be inside, and I suspect the guards were told to insure that no outsiders got in, especially while Miscavige was there. This is consistent with their use of private security at Saint Hill Manor. It was good-natured chaos, watched over by some tense security guards, who had (unknown to anyone at the time) had apparently been tasked with in insuring that nobody got anywhere near David Miscavige, nor saw nor heard his speech. At the bottom of the this page, there are a number of videos illustrating the character of the protest. It’s at about this point that the opening ceremony seems to have taken place. It’s then that the security guy in charge gets to tell the curious press that the ‘ribbon cutting’ is over – (although he doesn’t give anything else away at all). You can see his relief. This wasn’t to last long. A local resident was so incensed with the blocking of the area alongside with crowd-control barriers that he put his little girl over them and defied the security guards to remove her. He also wanted to know why they weren’t wearing the required identifying armbands. The guard in charge would not even tell him what company he worked for. A little later, a young man was led out by Police and told to leave in his car, which was parked on the grass verge almost opposite the entrance. He had a chat with the locals gathered there watching the protest for 10 minutes or so, before the police came back to insist that he left (i.e. go right now, or we will have to detain you). It turns out that he had approached the main gate, then suddenly sprinted through. The guards went after him, but by the time they had raised the alarm he had also made it through the internal security gate too (take a pause for thought here – a Church with a security gate?). My impression is that he did it for a laugh, and a story to tell at the pub later in the day. He expected to be chased about by the security guys and then led out. What happened is that he was leapt on by four of them, taken to the ground and then dragged out. A good-natured prank was met with a humourless and disproportionate response. You could see evidence of this in the mud on his shirt and way he was shaken up. He had only been arrested so that the police who were called had the authority to remove him from the property. When they had him outside, he was cautioned and let go immediately. There will be no serious consequences for him. One of the things he mentioned (in the video below) was the odd behaviour of the Scientologists. They left him to the guards, but all pointed cameras or phones at him, recording video – just like the chap who popped up over the fence to video the press photographer who was standing on the wall to take pictures. When you hear in press coverage that there was an arrest, this is what happened. 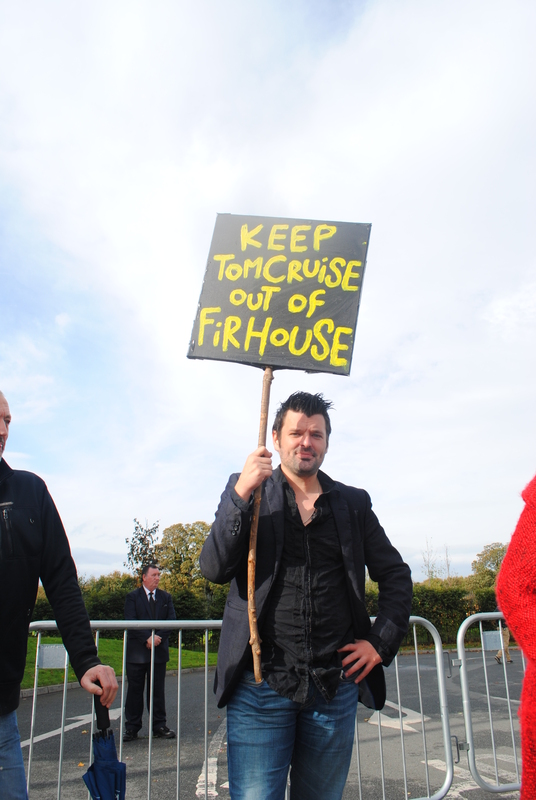 It wasn’t an activist or a protester – it was a local lad who thought he have have some fun but was brought up short, by private security operating under orders from Scientology. He said afterwards, “It was good craic” – an Irish way of saying that he did it for a laugh and to have something entertaining to tell his mates. However, There was an element of bravado there – but I really don’t think he expected the violence of the response he was subjected to. Of course, he had no idea that Miscavige was just around the corner, and the security company would go in hard because they would have been in serious trouble if he had disrupted proceedings, or alarmed the leader. If there’s such a thing as anti-craic, the Church of Scientology seems to have a natural talent for it. A few disputes were developing between the guards and local people, who were strenuously objecting to the closures and wanting to know what is going on, when the police turned up again. The ceremony was now over and the Scientologists who had been brought in from all over the world to make the outdoor opening ceremony look crowded, were now ready to board their buses and leave in their cars. The security guards were afraid that their departure would be delayed by protesters blocking the access, so they called the police to hold people back from the entrance on public safety grounds. This what happened – but not without some argument. Again, the guards managed to snarl up the traffic, a situation which had to be sorted out by the police. After the buses were gone, the last of the Scientologists trickled out and people on both sides of the barriers started to go home (including me). Since then, I’ve been informed by locals that people came back on the following day to protest again. David Miscavige having left, Scientology will have to mount a frantic PR effort. Those assigned to that task will have been handed a poisoned chalice. 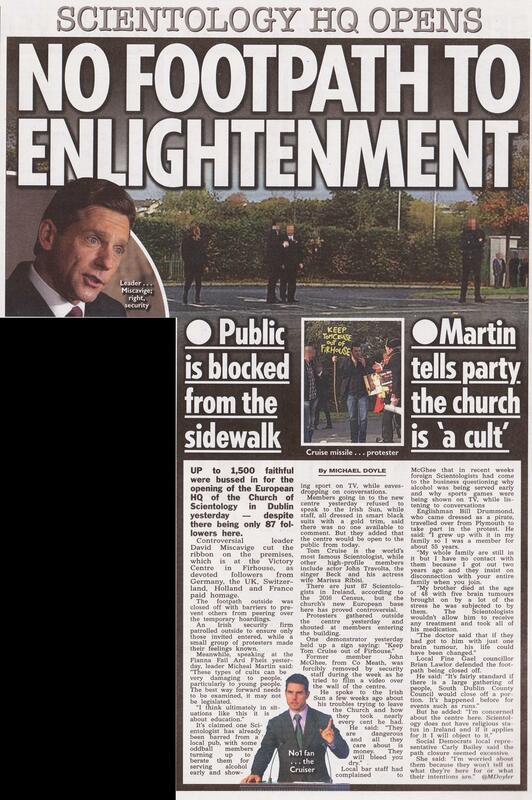 It will be a long time before anyone trusts the Church of Scientology in Ireland, after the way they behaved. As I was still writing this post , the first pictures were released from Scientology – which show part of what was happening behind that wall. 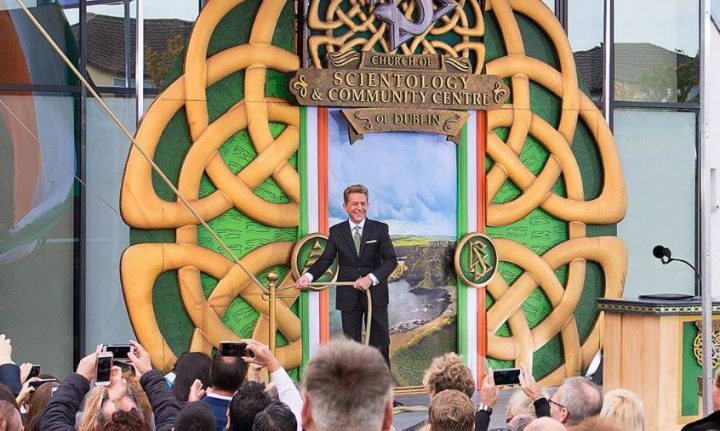 This is David Miscavige pulling the rope that ‘cuts’ the ribbon, and opens the facility. Unusually, he is doing this all on his own. 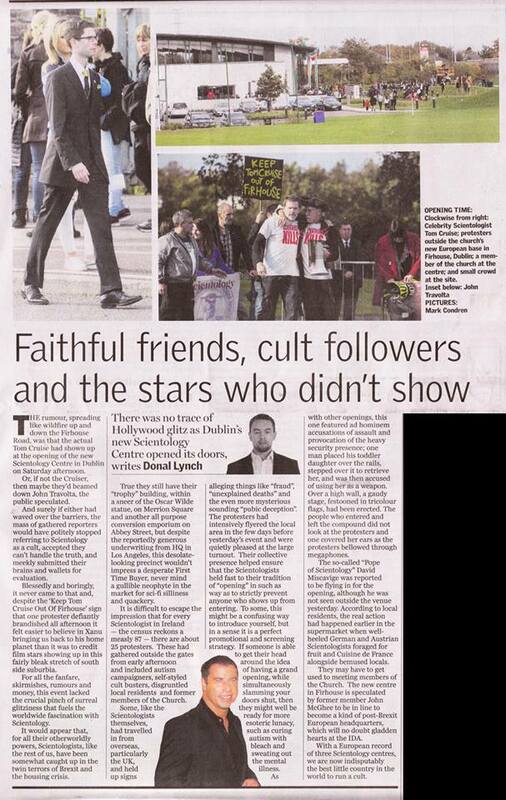 On the 24th of October, the Irish Times reported that two charities were “duped” into distributing literature promoting deceptive Scientology front groups and participating in the opening ceremony, to praise Scientology’s deceptive ‘social improvement’ activities(which actually only promote Scientology). 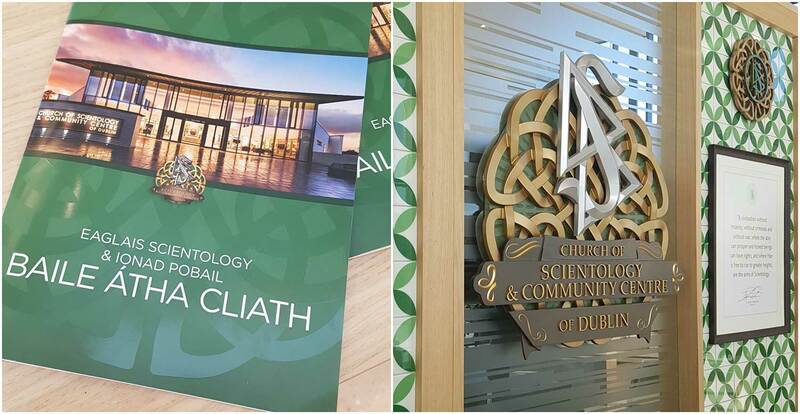 A respectable government-funded anti-racism charity (Sports against Racism Ireland) had distributed ‘human rights’ literature produced by an entity which is wholly controlled by Scientology but does not mention the connection anywhere. Also, an anti-drug charity which had distributed Scientology leaflets and praised their ‘drug rehabilitation’ work and took the trouble to state in the article that it “does not endorse the Scientology ‘Drug Free World’ programme”. They likely discovered that discovered that this entity promoted another Scientology front called Narconon which basically offers ineffective Scientology training combined with their utterly unscientific ‘detox’ programme to people with drug dependence issues. Scientology’s various front groups have become more active of late, because people actively avoid the Scientology brand. These front groups include anti-drug, pro-human rights, anti-psychiatry and tutoring organisations which use only Scientology teachings, but conceal any connection to the Church. 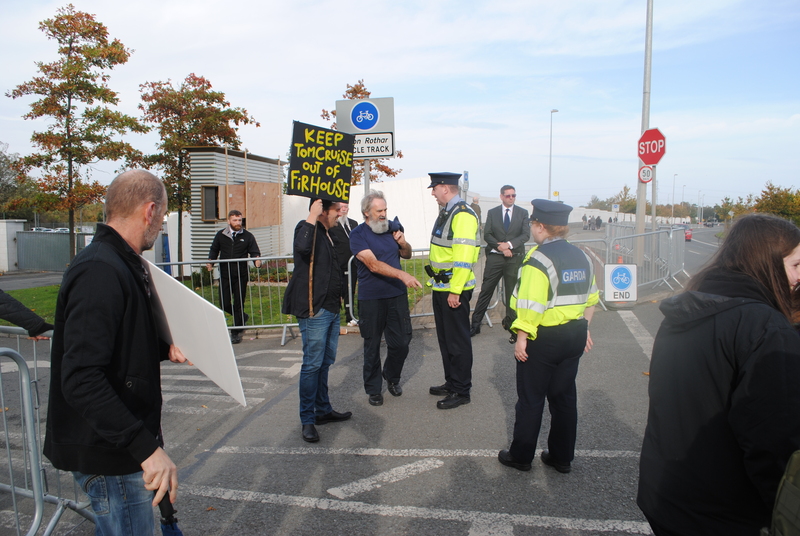 All of that – the wooden barrier, the construction, organising the permissions to close a public right of way, hiring security guards… this must have cost thousands of Euro, and they spent this without the slightest hesitation just to control the presentation to their own members. In the process they have seriously alienated the local people and the national press but this does not matter to them. Scientologists can be relied upon to ignore press coverage because they are assured that the wider world is corrupt and full of what L Ron Hubbard characterised as “degraded beings” – i.e. non-Scientologists. Those Scientologists going in and out, studiously ignoring the wider world, seem to genuinely believe that the opening was a significant event on the road to saving the planet. Today’s efforts were designed to maintain that mindset by keeping them away from outside influences. 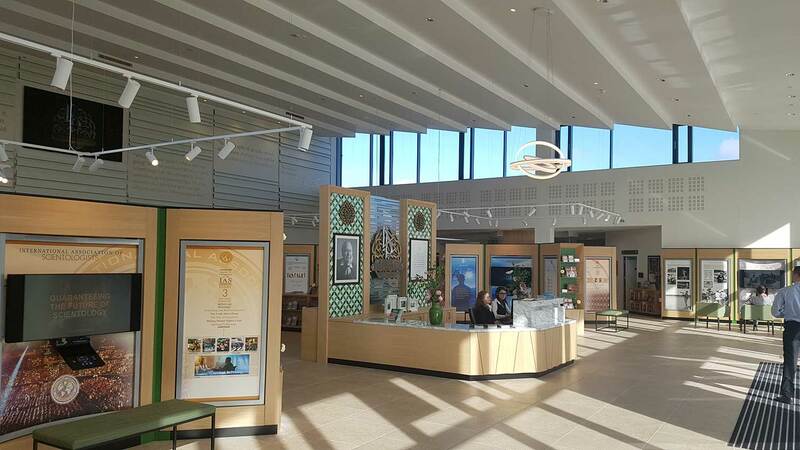 Critics theorise that these facilities are about obtaining valuable real estate and giving members the illusion that Scientology is expanding. However, once they are open, they will stand empty and unpopular. This is just as well, because the press coverage (see below) was calamitous. Also, according to news reports, a wide range of local and national politicians were invited but only one accepted, to see what it was like and report back. His invitation was later withdrawn. This could be one of the reasons that Miscavige is so lonely on his podium – the point of the rope pull is to show that a kind of teamwork is in effect. In the US it looks like one end of a tug-9f-war. It misses the point to pull it on your own. I’m assured by locals that people have returned to protest again today, and the press is still having a field day. There is no positive media coverage nor, as far as I know any official statement from Scientology. Anyone is welcome to copy and use any of mine (although the odd link back here would be nice :-). I was impressed by how knowledgeable some of the local people were about Scientology. Several referred to what they have learned from watching “Going Clear” and episodes of Leah Remini’s series. I also decided that I quite like the Irish people, who are friendly, relaxed, and tell it like it is. Here’s a selection of the press coverage. Even specialist publications like “Conference News” (which is aimed at conference organisers and conference centres) is reporting the event online – very unfavourably. Presumably this is due to Scientology’s bizarre provision of a 1,300 seat hall for it’s 87 Irish members. Yes – it’s remarkable that there are no people at all in these pictures. Churches typically aspire to be more about the community of believers than the buildings they occupy. 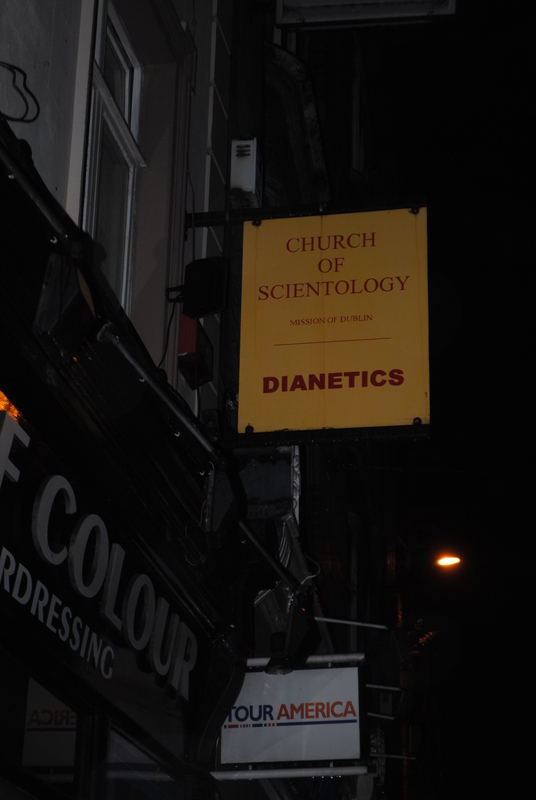 Not so the Church of Scientology. Critics have observed that this saves Scientology the embarrassment caused when people who appear in photos defect and attract publicity. Consequently, they always publish pictures of new ‘Churches’ without any parishioners. Also, the sign reads “Church of Scientology and Community Centre”. This suggests that the ‘community centre’ (which is carefully segregated from the Church) is going to be a vital part of their pitch to the community. 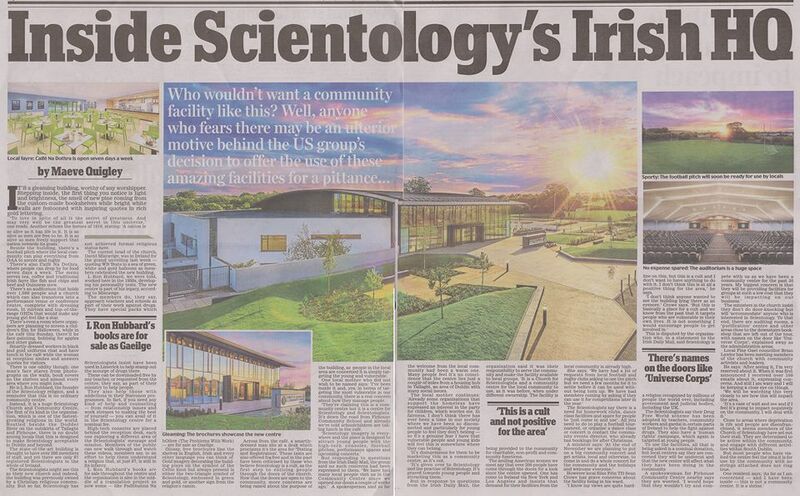 Somewhat later, when it emerged how Scientology is trying to tempt local people into their new facility, this story was published. 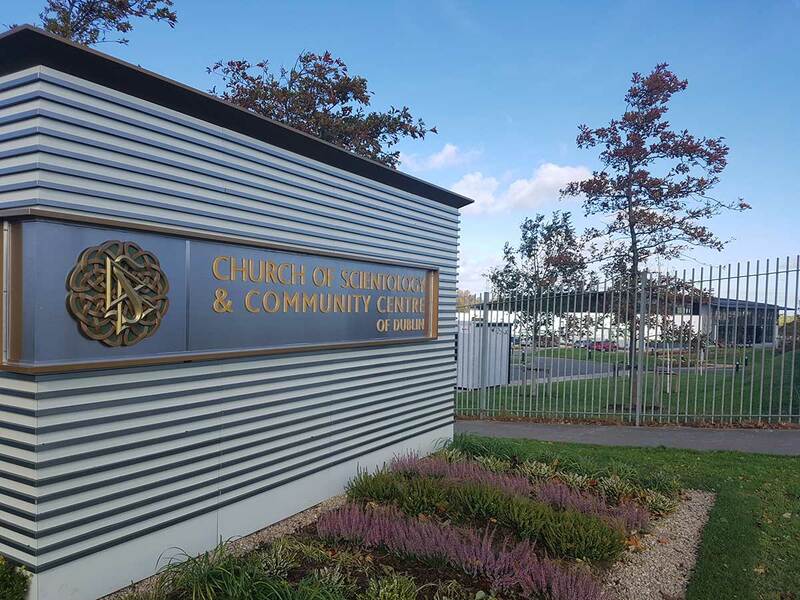 It is very sceptical indeed about the ‘charitable’ motives of the church of Scientology in Ireland. « How Much Does Managing a Protest Cost the Church of Scientology? A Lot More Than You Think! great reporting. Thank you very, very, much! Drop back in a day or so, and I will have added a few more videos, and tidied the whole thing up. That’s also utter BS that they closed a public right-of-way and a bus stop without any warning to the locals. And that closure might not even have been legitimate, if they applied for it (as I was told) on the basis of “Works” being done – that’s something like digging up the road, which didn’t happen. What’s more, they were letting Scientologists through, but not locals, so the only reason for the ‘security’ around the front of the building was to stop non-scientologists looking over the wall. Excellent article ,I hope SDCC have recieved a barrage of complaints about the path closure ,even if it was for “essential maintenance works” not one of the security guards or people behind that barrier wore safety clothes in line with health and safety guidelines .One law for the general public and a different one for anyone who attended event and wanted to use path . Absolutely disgusting !!!!! 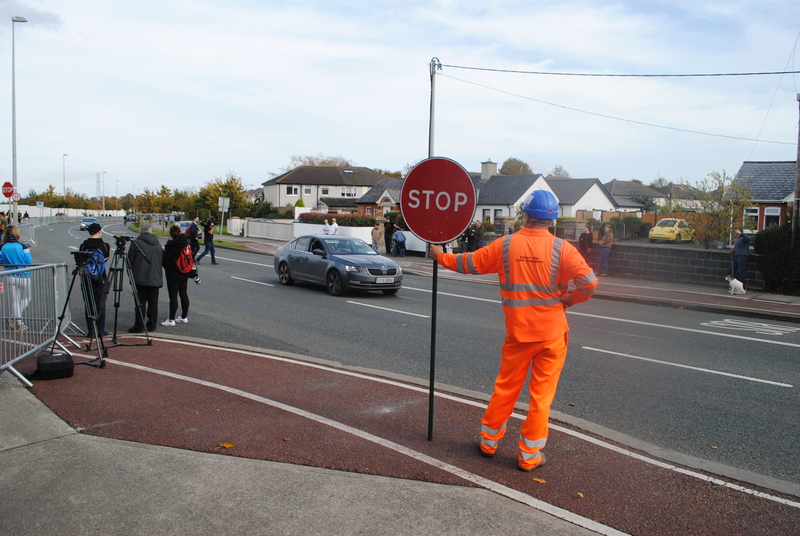 The people who put out the crowd-control barriers were dressed in the kind of heavy trousers and jackets, covered in reflective panels that you see on outdoor workers. However it was a pleasant day, and I was hot in a t-shirt and light jacket, just walking around. These guys kept the hood on their jackets up. That makes me wonder if they were Sea Org. All of the private security guys wore dark suits. However, none of them wore ID. I don’t know about Ireland, but in England this is compulsory when dealing with the public – usually in the form of an armband. In the videos in the post one guy argues with them about this, but the head man refuses to even identify the company he works for. Previous observations from Saint Hill in England suggest that they are demanding that the private security become more aggressive and they seem to have found a compliant company which declines to identify itself because it knows it is on uncertain ground. It should be noted, that the barrier at the far end was swept aside for Scientologists who had come by car and parked nearby. The guard ‘patrolling’ the sidewalk was informed of incoming by walkie-talkie and Scientologists made their way along a closed are unmolested. 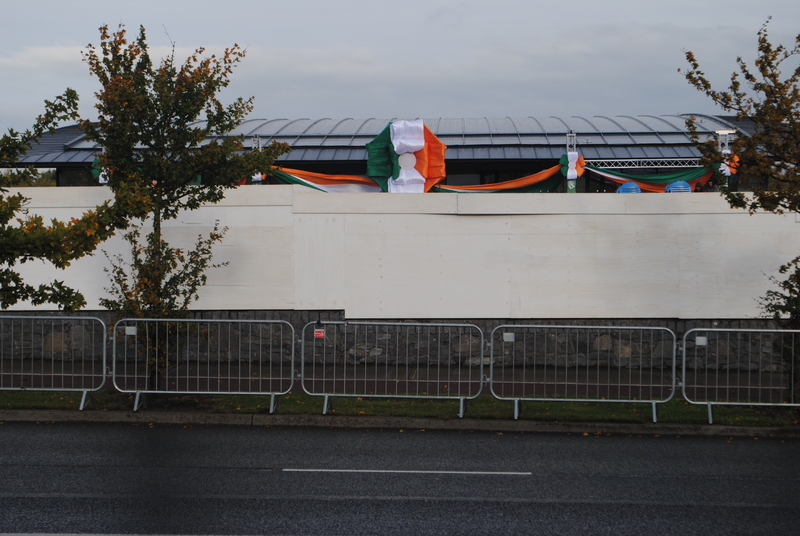 If you look at the photos of the rosette, the ceremony took place just over that wooden barrier. The outward-facing loudspeakers were placed at that point so nobody could stand by and record the speech, and the closure of the sidewalk was to insure that nobody stood by with a camera on a (long) stick and take pictures. This is David Miscavige’s paranoia made manifest. The sole purpose of the closure was to prevent Miscavige’s speech being seen, heard or disrupted, and the Council was had. I would assume anybody behind the barrier would also need safety clothes and shoes to avoid any accidents in line with safety requirements , As far as im aware and i have spoke to a security employee armbands are mandatory and must be visible at all times by security staff . 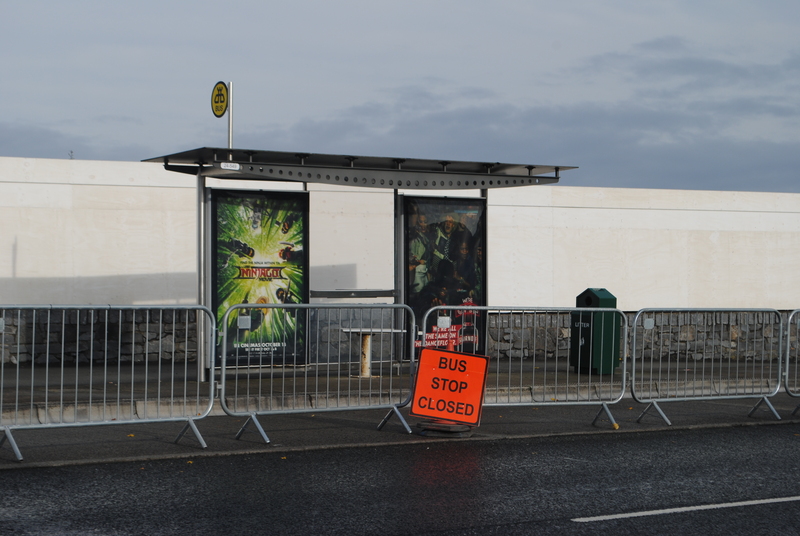 Dublin bus wasnt even informed of bus stop closure . I agree that those requirements are not only the law, but also SOP for any responsible company. I witnessed the scene and took photos and video. None of those precautions were observed. I’m extremely interesting in the security company, who they are and if they are even legit. If the hiree of security doesn’t need to tell the council who they are, can Sci pay some shlubs under-the-table to pretend to be security? It’s risky but Sci is also fine with going against the law and just sending the local authorities a shrug in the mail after the fact. When I was at Saint Hill recently, I had reason to believe that the professional security company operating there were being pressed to be more aggressive – and, to their eternal credit, were not doing so. I think the guys in Ireland were employed by a real security firm, They had the look, knew each other and were effectively organised. However, I think the company was chosen because they were prepared to be somewhat more compliant than the ethical Saint Hill mob. They would not tell reporters or local people what company they worked for (you can see that in two videos) which suggests they knew they were doing unpopular work. I don’t know about the Council, however. I don’t think even Scientology would buy in random muscle because such people would likely be far more trouble than they were worth. As for ignoring inconvenient laws – I recently learned from two sources that they didn’t tell the bus company about blocking off the bus stop, or using private security to prevent people accessing it – so yes – it’s easier for them to apologise insincerely than it is to ask permission and risk being refused.